In addition to the books, there’s also a module guide and a software guide, which are only available online. I’m happy to look/read through these books before reading the guides, but I’m not likely to start studying properly until after I at least get the software guide. I want to know I’m using the correct version of BlueJ (the module’s preferred/required programming IDE) and plugins/software modules. The Exam Handbook only allows for highlighting for use in the exam, and must be the OU-printed version of the handbook. So I’ve put that back in the box, slipped it under my monitor tray, and won’t get it out again until the exam. That’s in contrast to the other books, which are now back in the box under my monitor tray, where I’ll leave them until after the entire module’s over, at which point I’ll toss them in recycling. I wish the OU would give me a choice of whether or not I want to receive hard-copy materials. I still have my useless SenseBoard on my desk, not sure if I can ever find any proper use for it. There’s one book due to be shipped for TM254, but I suspect they missed the shipping date, which is standard procedure for first-run modules: Make certain that everything is behind schedule. The book being shipped is Project Management for IT-related projects (2nd edn), edited by Bob Hughes. There’s also an ebook being made available to us (likely on a limited time loan, I’m guessing) for ITIL Lifecycle Essentials by Claire Agutter. I’ve snooped through this as it’s available to all students through the OU library. It seems well written, and is thoughtfully laid out, so I don’t think I’ll have any issues with it. Six years is a long time to work on anything. I’ve only had one job which lasted longer than that. (In fairness, so did my dad … Since he only ever really had one job.) But it’s a bit of a rush to realise I’ve only got four more final prep weeks ahead of me. How’d it go this year? I took many fewer MOOCs, but learned much more. This summer’s work has been worth well more than twice what I’ve been through with TU100 so far at the OU. Computer science and object-oriented programming were covered in far more depth than just introductions, abstract program design was probably at introduction level (possibly a bit lower), and my mathematics refresher was very strong: It seems to have covered all of MU123. And all of it was free! I’ve also gotten cosy with this year’s modules. For MST124, as I said, my Khan Academy prep seems to have taken me through everything I would have been exposed to in MU123. Additionally, I’ve worked through the “boot camp” for MST124 (a series of practice tests and live/recorded tutorials reviewing pre-MST124 maths), and the first two units of MST124. MST124 is unique compared to other modules I’ve been exposed to or heard about at the OU: They recommend you open your books and start going through the material as soon as you get them. They know that this stuff is difficult for some people, and give us as much time to get through it as possible. So even though I’d planned on only getting a week ahead with my study, I’ve done as recommended, and am three or four weeks in. It’s going really well so far, with only some silly and redundant trigonometric concepts giving me pause. I’ve even rattled off my first TMA, which I’ll talk about in a different post. For TM129, there’s not really much prep work for me to do. TM129 used to be three separate 10 credit modules which have been grouped into a monolithic 30 credit module. These previous modules are preserved in TM129’s three blocks: robotics, computer networks, and Linux. The second two blocks don’t need much explanation: I work professionally in both of these fields at a level higher than that covered in the module, so there won’t be much for me to wrap my head around. 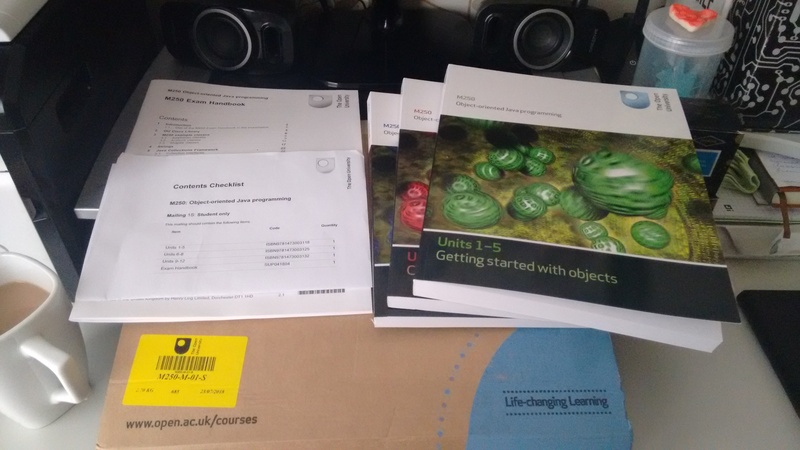 I’ve only been through the first week of the robotics block, but it seems I’ve inadvertently had the perfect preparation for that: the Begin Robotics MOOC presented by the University of Reading on FutureLearn. A lot of the same material is covered, with the academics stripped out of it in the MOOC. It looks as though the MOOC went into more depth into cybernetics, but I’ll know more later. Well, I’ve done prep work for all of that, too, already: It was called TU100. My TM129 materials finally showed up yesterday. I’ve already described the box contents, there was nothing unexpected. I’ve had fun re-reading I, Robot though. TM129 has one TMA for each of its three blocks, but they won’t be visible to read until closer to their due dates. (My experience on TU100 tells me that it’s possible the module team isn’t done writing them, yet.) I gave TMA00 a glance, expecting it be along the lines of write something about why you’re taking the class, and make sure you know how to zip and upload. On the one hand, I was right: Those things are part of TMA00. But the second half of it wants us to explore the ePortfolio. So how does this fit into TMA00? You’re asked to make an ePortfolio entry. Not a fake one, and not a TMA00 specific one. You’re supposed to read through the ePortfolio and choose any one activity to give a go. I’d like to shake the hand of the genius who dreamed that up. It’s a brilliant way to engage the students in A) familiarising themselves with the types of activities contained therein, B) the relative effort levels required, and C) give some thought as to what will be required to complete them. If they’d asked students to do those things, about a quarter would probably actually spend any thought on it. I’m keen to see how my tutor responds to my solution. To paraphrase Kirk, I changed the conditions of the TMA. I set myself a challenge that yielded the same result as the proferred activity, but did it in a different way than directed. (I also did it the way that I was directed, just to cover all the bases.) I then tied the learning outcomes to the self-created task, and wrote about that, instead. I highly suspect this will work, but I’ll let you know. Anyway, it’s not the only TMA work I’ve done this week. I’ve also done half of MST124’s TMA01. I’ve decided to use Word for my TMAs, since that’s likely the only place I’ll need to use written maths skills in the future. I’ve finished Unit 1, and will complete the rest of the TMA after the module starts and I get through Unit 2. Whilst many of my TM129 peers received their module materials yesterday, I’m still (sort of) waiting for mine. I’m only sort of waiting, because A) the James May show on the DVD is on YouTube, B) I already have an e-copy of the Microsoft Networking Essentials book, and C) the I, Robot book was a favourite of mine in junior high school. As these are the only three things in the box, I can probably stop worrying. I’ve looked a bit at the TM129 online materials, which starts on the Robotics block, but I’m not really bothered by it. My studying will be very similar in style to TU100 (active reading through bullet-point notes, combined with activities stored in a OneNote notebook on the cloud), so while I probably will start the study a bit early, it’s not really necessary. MST124, on the other hand … I can’t really figure out how to study this. The first half of the module or so is going to be revision. (That’s “review” to any other Yanks in the audience.) I’ve spent a few hours this weekend trying to “study” it, but all I’m really doing is glancing over the descriptions, then working on the activities. As it’s all review, I haven’t come across anything that I can’t do, yet, so I don’t know what to do when that happens. I think the first thing I’ll do is hope for recorded online TMAs. If I can watch a recorded online TMA, I skip the roughly 30% of the time that the tutors give over to sitting around waiting for people to work on examples. I watched two revision boot-camp tutorials this week, and easily saved 40 minutes on each of them by skipping over empty sections, and more time skipping parts not relevant to me. The only questions I ever ask during tutorials anyway are those to do with policy. I mostly sit in because I know the tutors will drop TMA-specific hints. Next, until I get to differentiation, I’m going to work backwards when necessary. I’d like to do all the activities in the books to make sure there are no blindspots, and because practice is the best way to retain maths skills. If there is a blind spot, I’ll back up and run through it, encorporating external resources as necessary. Finally, once I get to and past differentiation, I think I’m just going to wing it. Read without notes, try exercises, and practice, practice, practice. Taking notes just doesn’t make sense to me with maths. The closest I’ll come is following along the examples with a pen in hand. I may alternate weeks between MST124 and TM129, as splitting days may throw off my rhythm. We’ll see how it goes. My intent is to stay one unit ahead throughout the module. I’ve fallen afoul of getting too far ahead before, and the motivational issues that causes. It can also make it a headache for revision. Well that was earlier than expected! I didn’t expect them to ship the books for MST124 out for another two weeks, but they were waiting for me when I arrived home yesterday. I had a look through the guide, the handbook, and the computer algebra guide, and then searched through they Labyrinth of Hidden OU “Support” Forums to look for anything interesting to do before the site opens. The first thing of note was that the guide actually encourages students to start as early as possible on the material (literally as soon as they get the books, and before the site opens) and stay ahead until they’re done and it’s time to revise. Cool! Finally a module for the hares! I downloaded and installed Maxima, and will use it as required, but as soon as the module’s over I’ll go back to doing what I used to do: WolframAlpha. Maxima basically takes the place of requiring everybody to buy an expensive graphing calculator. Then I looked into typesetting. I have a lot of conflicting thoughts on the typesetting. The first is that during the exam, I won’t have a computer to make my work pretty, so I may want to simply practice writing it out by hand for performance sake. As I browse through the specimen paper, I don’t think this is much of a concern. So for computer typsetting of my TMAs, I can either use LaTeX or MS Word’s equations. (Or OpenOffice, I suppose, but I’m intentionally using MS through this degree course. Another option would have been to use LibreOffice with the TexMaths LaTeX plugin.) Last night I went through the guides for both. Going in, I thought that LaTeX would be the better solution, as everybody glows about it. It’s more work to learn, but apparently worth it in the long run. In my opinion, the long run would have to be very, very, very long indeed. It took about five times as long to learn as Word, because in addition to speaking its language for the maths, you also have to build the entire document around it. Making a decent TMA template would probably take an initial few hours to get it looking as good as Word, with researching all the required functionality. That said, if I were doing an entire maths degree, or was writing a book or thesis, it’d probably be worth the investment. It’s absolutely professional quality. Word, however, was much easier, quicker to learn, and was just barely behind in professionalism. The only drawback was that the size of dynamic brackets wasn’t as nice as it was in LaTeX. In exchange, you get to not worry about the rest of the document, easier and more intuitive codes, the ability to avoid codes altogether and instead point-and-click, instant rendering and feedback, and the data is then extremely portable rather than locked in a PDF. If I need to write equations in another module (as I had to on every TU100 TMA) or elsewhere in life, the Word experience is also more portable. If I needed complete control and customisation, then I’d probably opt for LaTex, but don’t see that happening in my current life tragectory. It’s possibly worth it to learn the LaTeX codes, however, as they can be used in the Open University forums. There are a few pre-module tutorials they’re running through September, and I’ll probably check one or two out, but I’m not that concerned. After the Khan Academy prep I did this summer, I’m pretty confident already with about half the module. 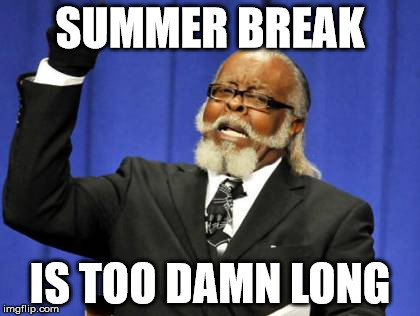 Something my nine-year-old self would be horrified to hear me utter: Will summer break just end, please? In addition to being a part time OU student, I also work in education. Well, okay, I work in a school. I’m not sure it has much to do with education. The point is, both my full time job and my part time studies shift considerably during the summer. For my studies, I transition to MOOCs of personal interest. This year has been wonderful for that, because I’ve really come a long way both in terms of programming languages and programming design concepts. But … It’s just small hobby stuff. And I can’t get involved in big hobby stuff, because I don’t want it to overlap and eat into my OU studies. Last summer by this time, there was an Introduction forum open, followed by course-specific early-bird forums. I’m anticipating early-bird forums amost as much as my grandparents used to anticipate catching dinner at Sizzler at 3 PM. I hope they still have them. (The early-bird forums, not the early-bird dinner special. Though if Sizzler’s around when I retire, I’m definitely down for dinners before the school run.) It seems like a good way to gel the nation-wide footprint of students for the presentation before splitting us off into tutor groups, so that we can bond and feel more comfortable in the FB groups. But really, I just want to get stuck in again and be studying properly. My poor nine-year-old self would have fainted by now. This is just an update on my last post about maths prep for OU’s MST124 module. Altogether I’ve given it about two and a half weeks of study and revision, and I feel completely confident with my level of maths going into MST124. I think my breakthrough occurred when I decided that I probably should stop trying complex equations in my head or doodling on my screen with the mouse. It was when I pulled out a pad of paper and a pen that it all slotted into place, and it turned out my brain hadn’t completely liquefied in the several decades since I’d left school; It was just super lazy. Not a shocking realisation, then. I went back onto the OU’s Maths Choices MST124 diagnostic Are You Ready quiz last night, and this time ran away with full marks in less than 15 minutes. A dramatic increase on the 40-something minutes it took last year for 70- or 80-something percent. Still, that’s simply being able to crunch the numbers. If they were to throw words like “justify” or “explain” I’d be reduced to the sludge in the bottom of my vegetable “crisper” in no time. So I still have plenty to do this summer in terms of getting proofs down and maybe skipping a bit ahead so I’m not taken off guard. The MST124 journey of a thousand miles begins with a single st… I have HOW far to go? When deciding between the MU123 and MST124 maths modules for my degree, I put a fair amount of weight on the diagnostic “Are you ready?” quiz for MST124. It said my results were good, there were a few areas I should brush up on, but overall I should be just fine on it. When I do those, I perform a bit better than I did on the MST124 AYR quiz. I note my weak areas, I study the sheets, and I do better. But it kept feeling like it was only checking a very, very narrow section of maths at that level. They’re not that difficult to study, it’s just that there’s SO MANY OF THEM! I’ve “mastered” something like 650 identified skills, and have more than 500 to go. Granted, that’s for all the maths they can currently teach and evaluate on Khan Academy. I won’t need anywhere near all of them by the time I start MST124. But the skills can sometimes take an entire night. I’ve got a hundred and thirtysomeodd days until the module starts, and a lot of those are on holiday. In a lot of ways, the pre-study preparation feels harder than TU100 was. Unlike TU100, though, I’m learning tons, not just practising. And the practise is definitely necessary to get me into fighting shape again for the module. And more practise. And some more. And it’s also fun. But that part isn’t different from TU100. I’ve really enjoyed my journey so far. I won’t know until after I’m in the middle of it which was better for preparation: The OU MST124 preparation site, designed specifically for it, or Khan Academy, which is pretty much drinking from the fire hose. Or Niagara Falls. We’ll see how it goes. One final bit for today: Results for TU100 will be in on 19 July. My tutor will give us a cheeky heads-up if we passed or not before that, but nothing more.